Posted on March 26, 2013 by Pat B. A recent study conducted by the Nielsen group, the TV ratings people, about how people use their Xbox 360 and Playstation 3 yielded some surprising results. Each console has its own unique identity that gamers have come to know over the years… or have we? We currently know the Xbox, with its endless list of media partnerships, as more of an entertainment hub than a dedicated gaming console. 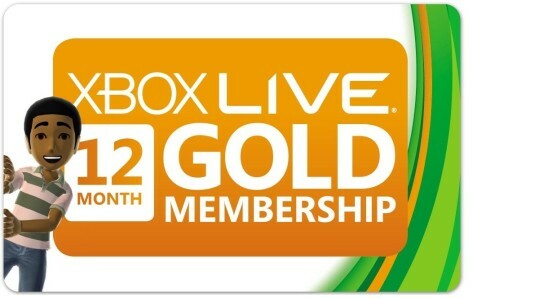 Movies, sports, music and shopping are all available to those people who pay for access to Xbox Live. A Live membership really is mandatory if you want to fully experience everything the console has to offer, and that includes the ability to play games online with your friends. A 12-month membership to Xbox Live currently costs $59.99 in the online Microsoft Store. The PS3 offers similar entertainment options like Netflix, Hulu, and Amazon Instant Video… except that users don’t have to pay to access them: the PlayStation Network is free to all. 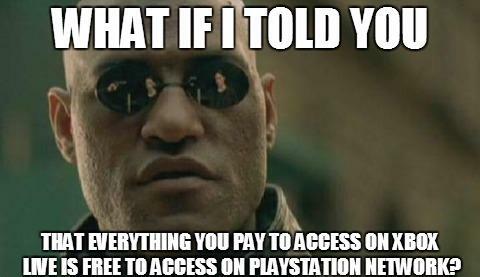 Sony does offer a premium pay service that gives users access to additional content, but it’s not required in order to enjoy the bulk of the PSN. However, the PS3 really isn’t known as the console you use to catch up on Downton Abbey. It’s known as a high-powered console where games come to show off what they can really do. 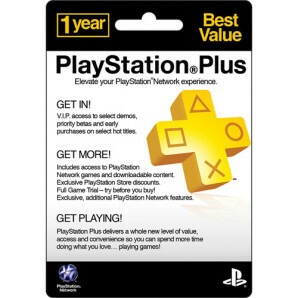 A 12-month membership to PlayStation Plus currently costs $49.99 in the PlayStation Store. The Nielsen study showed that in 2012, PS3 users spent 54% of their time using the console for non-gaming activities and the other 46% for playing games. What about Xbox 360 users? They spent 66% of their time gaming and just 34% of their time on non-gaming activities. Hmm… that’s odd. 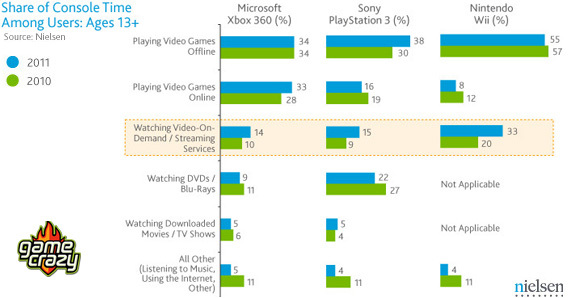 According to these numbers, the PS3 is the entertainment hub while the Xbox 360 is the dedicated gaming console. How do we explain this role reversal? Spare a Few Dollars, Sir? It comes down to the PlayStation Network and Xbox Live. The PS3 grants free access to most of its entertainment options with only a modest pay membership for additional gaming content. Like the Salvation Army bell ringer at Christmas time, you don’t have to give them a cent, but if you do, you’ll feel like your money is going to a good cause. In this case, Sony, which still reports big losses at the end of each fiscal quarter. 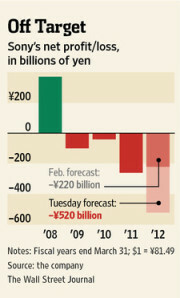 Doesn’t matter if it’s in Yen or Dollars, red is bad. Now look at Xbox Live. In order to access any of its basic online services, including online multiplayer, you have to pay a membership fee. Then you have to pay more for memberships to services like Netflix and Hulu. It doesn’t really appeal to the frugal gamer, who’s left with little after shelling out for the console and then an Xbox Live membership and then a game. What makes this study even more interesting is that its results are seemingly being ignored by Microsoft and Sony. Clearly, they have access to usage statistics for their consoles, yet their next generation machines are embracing the assumed identities of their predecessors. The PS4 is focusing on gaming and the next Xbox is focusing more on entertainment. This entry was posted in The GC Blog and tagged nielsen study, playstation 3, playstation network, xbox 360, xbox live by Pat B.. Bookmark the permalink.